Praying Through Your Pregnancy shows a mother how to provide an early head start for her child through the power of prayer. With fresh spiritual insight, each chapter reveals what is happening with the baby's development that week, starting with the very first moment of conception, when God begins the creation of either a boy or a girl. Readers will learn how the confidence they place in God affects the healthy development of their precious growing baby, and how to reduce their own stress and anxiety by looking to the Creator. In this interactive guidebook, the author shares excerpts from her pregnancy journal as an encouragement for women to write their own thoughts and feelings, and each chapter ends with a Mother's Prayer and Scriptures for Meditation. 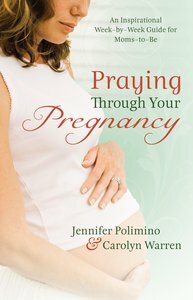 Praying Through Your Pregnancy was a 2011 Christian Book Award Finalist. About "Praying Through Your Pregnancy"
JENNIFER POLIMINO is creator of prayforyourbaby.com and the spokesperson for SlimMomCoach.com, an online coaching program for pregnant women. She and her husband, Dan, were the fitness experts for more than three years on FOX TV's "Good Day Colorado," and with their son, Micah, were "America's Healthiest Family." She has written for The Denver Post and Rocky Mountain News and her columns have appeared in newspapers across the U.S. Jennifer and Dan are the authors of T he Great Shape Up and accompanying DVDs. CAROLYN WARREN is the author of Mortgage Rip-Offs and Money Savers , a book about which syndicated columnist Robert J. Bruss said, "On my scale of 1 to 10, this superb new book rates an off-the-chart 12." She has interviewed on talk radio, including Bob Brinker's national show Money Talk and is a regular guest on the local Seattle Christian show The Walk . Carolyn participates in children's ministry at New Heart Worship Center and is the mother of a son and daughter.